"Yo..! MAG" is a versatile Free Blogger Template with an awesome magazine style blogger template - carefully crafted with keeping news and magazine websites in mind.Yo!Mag is one of the Best Blogger Templates in this category that will helps you to put you on the front line of digital News and article publishing world. This is a fully responsive design like our other Responsive Blogger Templates 2015,It smartly adopt all device Screens. 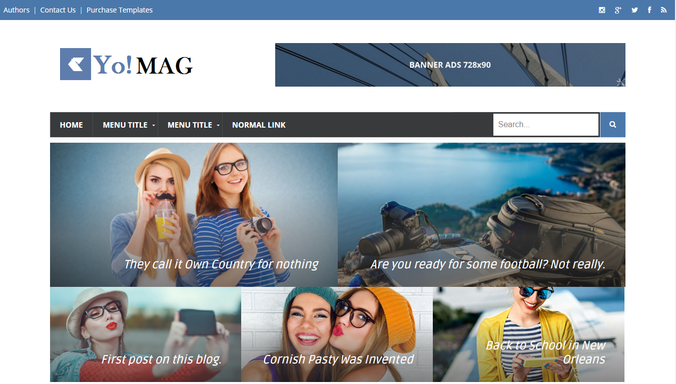 Your Blog will Look even better with the unique layout and all media ready design, It has the perfect balance between the content and advertisements spaces on prime areas without compromising with the looks. Our all Free Blogger Templates Comes In Two Versions(Premium and Free): Free Blogger Templates Are The Trial Versions Come With Encrypted Code and Some Restrictions, But Free Versions Are the Best Way to Check how Your Blog Will Look After Installation Of the Template.Premium Versions Are The Paid Version Which are Fully customizable with No Encrypted Code and lifetime customer support services. Try Our Template Installation Service: If you are not that tech savvy and don’t have much experience with blogger dashboard and HTML/CSS then you can opt our Blogger Template Installation Services package that will cost you $20, A good price for hassle free Installation process. Our Tech-Team will handle it and make your blog/site exactly like the demos. Thanks for such a great chance! I love it!! Great author! Photoshop Online Alternative is a perfect alternative to Photoshop (Photoshop Online). With photoshop alternative you can add filters, frames, text, layers and effects. Create an amazing photo collage, card, facebook cover, twitter cover, instagram images, youtube channel or design graphics.